Electoral reform in Canada 2017 : a relic of the 4½ months in 2015 when New Democrats looked like winners? 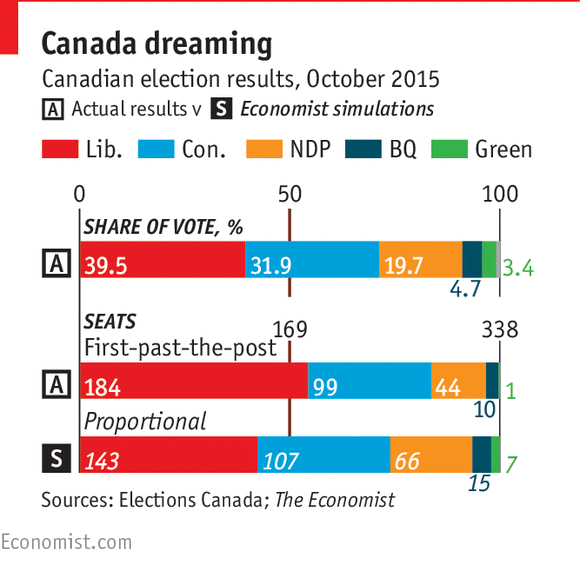 Economist magazine projections of what did happen in 2015 Canadian federal election (first past the post), and what would have happened under proportional representation. A bare majority in Canadian House of Commons at this time is 170 seats. [UPDATED FEBRUARY 1]. From the start of things in the last federal election campaign, I’ve had trouble understanding the mainstream media’s obsession with the electoral reform plank in the 2015 Liberal platform. Between the lines, at the very least, it has always seemed clear enough that what finally became Justin Trudeau’s majority government was only half-serious at best on this issue. As the report of this parliamentary committee in the real world has subsequently confirmed — and surely not to the surprise of many honest observers — there is no practical version of electoral reform on which all the federal parties (or even just the three largest) can agree. To start with, forget about “mandatory voting, and online voting.” They are just distractions (just rejected out of hand by the committee). And right at the start they were further signs that the Trudeau Liberals were mostly just blowing smoke on electoral reform. 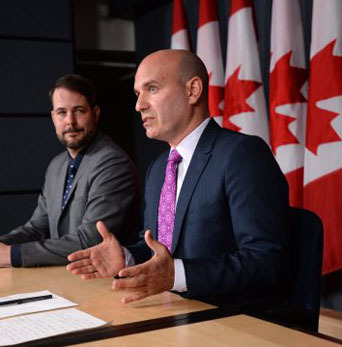 NDP MP's Nathan Cullen and Alexandre Boulerice hold press conference on electoral reform in Ottawa, spring 2016. Photo: Sean Kilpatrick/CP. The NDP’s long-favoured proportional-representation electoral reform, however, could mean that Conservatives would be almost permanently shut out of forming governments in Ottawa. 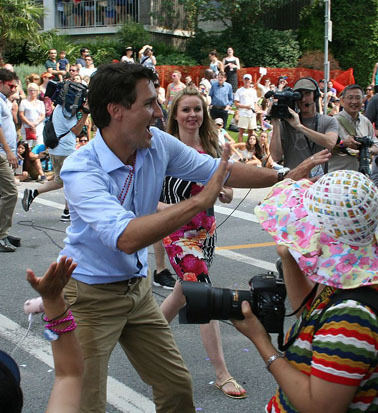 Justin Trudeau on campaign trail in Vancouver, mid summer 2015. Prospects of endless centre-left coalitions also seem to have convinced Prime Minister Trudeau’s party that it doesn’t really like proportional representation either. Under the present first-past-the-post system of ancient Anglo American lineage, Liberals (like Conservatives) can form governments with a majority of seats in parliament all by themselves. Justin Trudeau’s party would be happy enough with a kind of halfway-house version of real, democratic, proportional electoral reform, known as “ranked ballots.” But there is a little too much evidence that this could mean the federal Liberals are Canada’s natural governing party forever to be acceptable to either Conservatives or New Democrats. So … As a matter of democratic good manners (say), it would be wrong for any government to introduce a version of electoral reform that its opposition resolutely opposed. More practically, Liberals could use their present parliamentary majority to push through “ranked ballots” against the wishes of Conservatives and New Democrats. But, despite (or even because of) some vague efforts by Prime Minister Trudeau to test the prospect, it has become clear that this would just hand the loyal and other opposition a “Crooked Liberals Force Rigged Electoral Reform” assault weapon for the 2019 federal election. 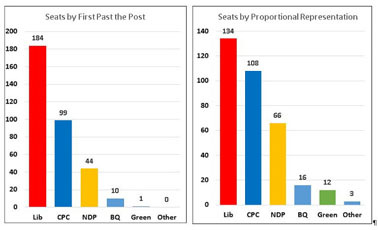 Seats actually won by party in 2011 Canadian federal election under present first-pat-the-post electoral system, versus what would have happened under proportional representation system. A bare majority in Canadian House of Commons at the time was 155 seats. 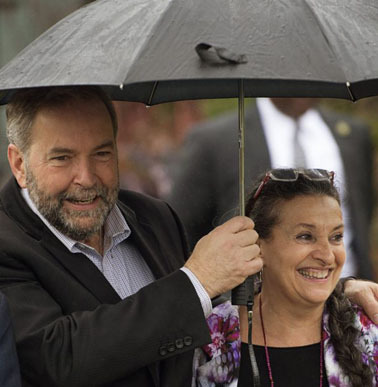 Thomas Mulcair and wife Catherine on campaign trail in Toronto, late summer 2015. As Don Martin on CTV seemed to wisely prognosticate last week, the recently released results of the Trudeau government’s Electoral Reform Survey can be most plausibly read as some penultimate sign that the arguably obvious deductions from the practical political arithmetic are about to come true enough. Put another way “clear accountability” finally triumphs over “compromise” — and this is also the outcome suggested by various provincial referendums on electoral reform in the early 21st century, with the partial exception of an ill-attended non-binding plebiscite in Canada’s least populous province of Prince Edward Island last year. Percentage of seats won by each party in the 2015 Canadian federal election, left, compared to the percentage of the popular vote. (Canadian Press). And as a practical matter “clear accountability” finally just means single-party majority governments — the sort of thing we’ve frequently had in the past at the federal level in Canada, that would most likely become much less common under proportional representation. In a proportionally representative version of the 2015 election, eg, some form of Liberal-NDP coalition would almost certainly have been required for a parliamentary majority. In rough round numbers the Liberals would have 39% of the seats and the New Democrats 20%, for a grand total of 59%, while the opposition would include Conservatives with 32% of the seats, Bloc Québécois with 5% and the Green Party 4%, for a grand total of 41%. 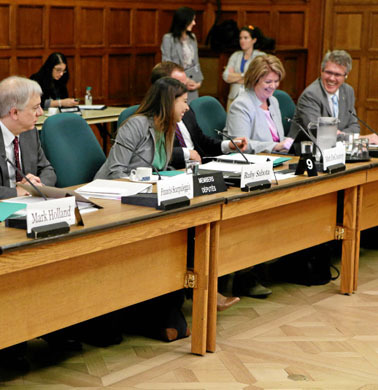 House Special Committee on Electoral Reform hard at work in Ottawa, summer 2016. Hill Times photograph by Jake Wright. Set this beside the just released Electoral Reform Survey, responded to by “about 400,000 people” on voters’ lists coast to coast to coast (one gathers : Ms Hébert says “mailed to every household”?). 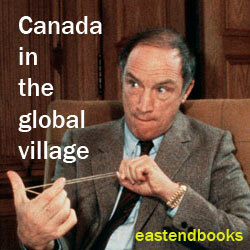 It does suggest Canadians value the “clear accountability” our present first-past-the-post electoral system provides. 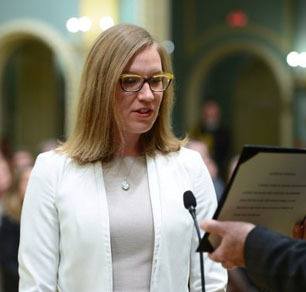 Fresh Democratic Institutions Minister Karina Gould is sworn in on January 10, 2017. Photo: Sean Kilpatrick/The Canadian Press. So … If and when journalists and/or politicians start asking the new and equally young and inexperienced Democratic Institutions Minister Karina Gould why the government has not introduced “legislation to enact electoral reform” this coming May 4, 2017, she would seem to have a pretty good answer to hand. First, the all-party parliamentary committee that was supposed to propose the particular version of electoral reform to be incorporated in legislation could not achieve any workable consensus. Yes it spent heroic hour upon hour listening to expert and other testimony, and debating among itself. But in the end it just kicked the hard question back to the government, with the proviso that a referendum be held on whatever the government came up with all by itself. Second, a survey open to all Canadians — and responded to by a pretty large group, based on the usual commercial experience with direct-mail surveys of the type undertaken, it would appear — did show that a majority of respondents were at least relatively satisfied with the state of Canada’s democracy. And there is certainly no great mass movement of Canadian voters out there, fiercely demanding electoral reform or else. 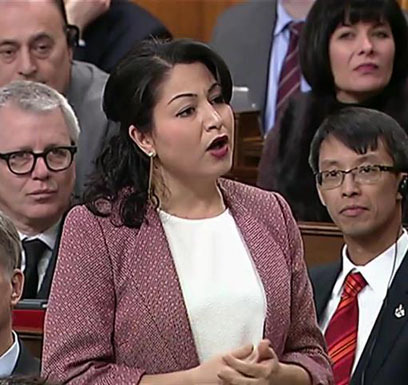 Former Democratic Institutions Minister Maryam Monsef in parliament early 2016. And it would not surprise me as well if this technical breaking of an election promise finally does the Trudeau Liberals virtually no serious harm at all in the 2019 election. Because in fact with their all-party parliamentary committee they have tried to do something, but found there was just no agreement among even just the largest three parties on exactly how to implement electoral reform. And because there really is no great popular demand for some essentially quite complicated “proportional representation” electoral system among the great mass of we the voters and citizens of today’s Canadian parliamentary democracy. Meanwhile … I am still left with the question : why has so much of the mainstream media been so obsessed with the electoral reform plank in the 2015 Liberal platform — when it has long been clear enough that there is no practical implementation of the general concept on which all parties can agree (for various good and bad reasons)? What I finally come up with here focuses on the time when the Liberal platform proposal first arose in press reports (and was first made public, as it were) — in the middle of June 2015. During this four and a half month period, it seemed to many (including me) that the New Democrats led by Tom Mulcair from Quebec just might finally win a federal election in Canada (with at least a minority government). And it was the early days of this period when the Liberals started talking about “ensuring that 2015 will be the last federal election conducted under the first-past-the-post voting system” — and made vague references to the “proportional representation” long favoured by Canadian New Democrats. I’d add to this something I was also told in the summer of 2015 by a reliable source : Much of the Ottawa press gallery had come to think that some kind of NDP victory on October 19 just may be the best possible outcome of the 2015 federal election for Canada. When the Liberals finally took a majority government with just under 40% of the popular vote, their electoral reform commitment seemed to many New Democrats and sympathetic journalists just another thing Justin Trudeau had stolen from the NDP to win the election. 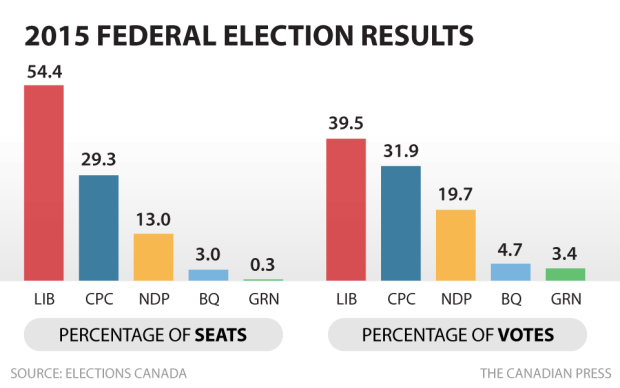 Another estimate of seats actually won by party in 2015 Canadian federal election under present first-past-the-post electoral system, versus what would have happened under proportional representation system. A bare majority in Canadian House of Commons at this time is 170 seats. 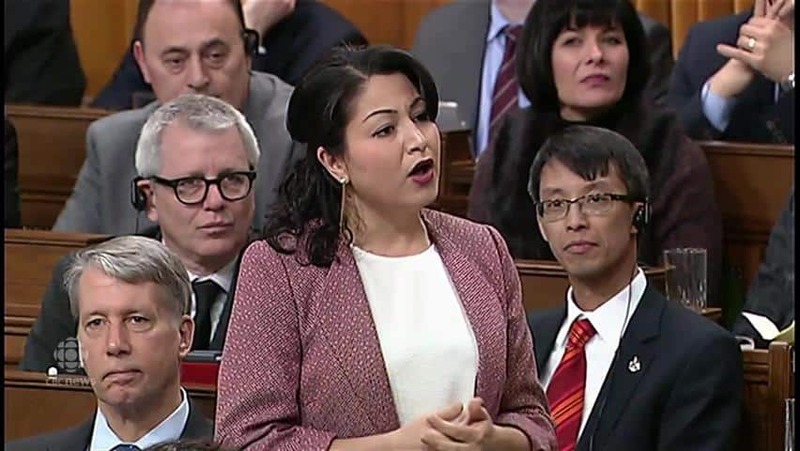 And there surfaced among similar partisans everywhere a fresh determination to at least try hard to make the Liberals live up to their electoral reform commitment during the election campaign. In the wake of both the all-party parliamentary committee report and the results of the now just released Electoral Reform Survey, responded to by “about 400,000 people” across the country, the hazy crazy days of late spring, summer, and early fall 2015 are increasingly just a memory that fewer and fewer among us remember. Proportional representation may be a good thing, from several points of view far above the partisan political wars. But right now only the federal New Democrats really believe in it. And if they ever managed to win a majority of seats in parliament with not quite 40% of the cross-country popular vote, they might start changing their minds too. Thank you for this article. It says most of what I would have wanted to say, thereby saving me the trouble of saying it. Besides, as my son pointed out last evening, with all the rampaging down south our government has quite enough worries already without this burr under its saddle. Also besides, it was clear that the debate in any referendum was going to be so poisonous and partisan as to do lasting harm, regardless of outcome. 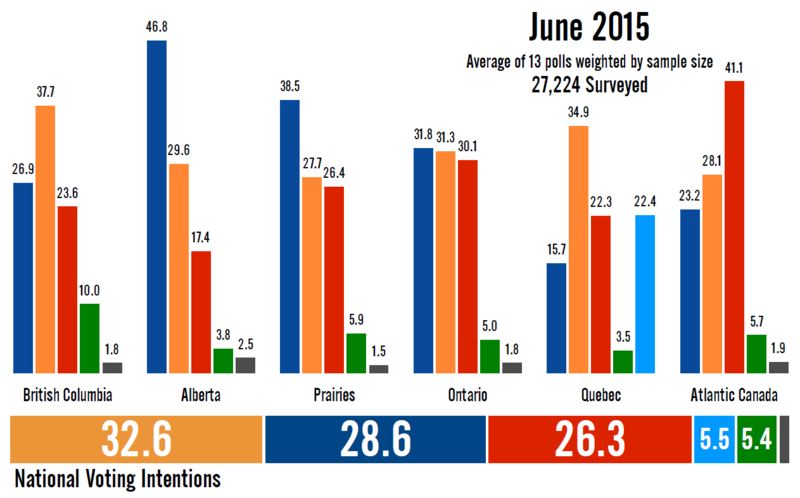 When we look at first-past-the-post nationally the system seems flawed. When we look at it at the constituency level, however, which is supposed to be the fundamental one, it’s nice and clear, and the voters are in charge, insofar as that is practically possible. Proportional representation would vastly increase the power of the parties to choose our representatives, and not just the candidates. I don’t mind the parties choosing candidates; on the whole I think they do a pretty good job. I don’t want them choosing my representative. I don’t consider my vote wasted just because my favourite didn’t win. I like it when the winner gets more than 50% of the vote, because then I feel the constituency, if not necessarily myself, is appropriately represented. But I am comfortable with a plurality in a fair run-off among multiple parties. Stephen Leacock called Social Justice an “Unsolved Riddle”. I think Electoral Justice is an Unsolved Riddle too under current conditions, and that all those who insist they have solved it are up to something. Usually it’s not difficult to see what. I think we could give the present government a modest amount of polite applause for admitting that they don’t have a solution and resolving not to try to ram one through. It’s not the government that makes it an Unsolved Riddle. The parties do. The press does. We do. For those who haven’t clicked on Paul Conway’s name above we’re pleased to underline that he and his partner Leslie Robbins-Conway, from the Bruce Peninsula in (the very northern part of) Southern Ontario, will be undertaking a re-creation (“re-tour”) of Stephen Leacock’s 1936-37 “My Discovery of the West” journey through Northern Ontario, Manitoba, Saskatchewan, Alberta, and beautiful BC as “A Canadian Sesquicentennial Celebration,” October 20th to November 28th 2017, from Orillia to Victoria. Check out their engaging “Voyageur Storytelling” website for more detail : http://www.voyageurstorytelling.ca/ . Many thanks for your editorial comment and plug. We are both most grateful. Usually we try to keep storytelling and political discussion separate, but Stephen Leacock is making that difficult, with his Unsolved Riddles and all. Such an interesting way of looking a complex political and economic questions. Warm regards. Stop the war on streetcars .. why does Toronto’s Ford family hate them so much? Northern lights on US election I : Will Sunday audacity of hope in Europe finally reach American midwest? The West needs new Middle East policies … but are we really headed for some new Grand Alliance from WWII?